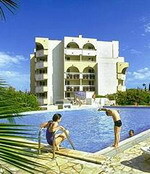 France Hotels - Book your French hotel room at the best internet rates. Menton is a commune in the Alpes-Maritimes department in the Provence-Alpes-Côte d'Azur region in south-eastern France. Situated on the French Riviera, it is nicknamed la perle de la France ("The Pearl of France"). Menton is famous for its gardens, including the Jardin Serre de la Madone, the Jardin botanique exotique de Menton ("Le Val Rahmeh"), the Fontana Rosa, and the Maria Serena garden. Le Val Rahmeh was established in 1905 by Englishman Sir Percy Radcliffe, the first owner of the gardens, and named for his wife. Villa Fontana Rosa was built in 1922 by Blasco Ibáñez, a Spanish novelist, and the gardens of the villa are now open to the public. 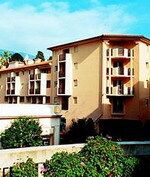 Located in the town center, 200 meters from the sandy beaches, Maeva Orion Residence Menton enjoys an ideal location. The old town and port are only minutes away, and the Garavan harbor and the Italian border are within two kilometers. Guests will enjoy amenities such as complimentary widsurfing boards, bicycle shed, business services, a lounge with mini library and vending machine, coin-operated laundry, and indoor parking. Pets are allowed for a fee of 46 Euros per pet, per stay. Each studio features a lounge with double convertible sofa bed, cabin area with two bunk beds, and a fully equipped kitchenette complete with two-ring hotplates, refrigerator, microwave oven, dishwasher, and coffeemaker. Other conveniences include a bathroom with WC, telephone, loggia with furniture, and television rental for 38.50 Euros per week. The modern Hotel Mediterranée in Menton is just a stone's throw from the old town, with its Provencal market, is situated just 200 meters from the sea. La Louisane, the restaurant of the Mediterranée, serves traditional French cuisine for breakfast, lunch and dinner. Guests can relax while in Menton, and sunbathe on the terrace, have a drink in the bar, and enjoy an array of amenities including laundry facilities, 24 hour front desk with multilingual staff, and underground parking garage. Guests of the Hotel Mediterranée, Menton, can choose between a visit to fabulous and flashy Monaco and the famed Monte Carlo casino, and the contrasting local artist's village of Castillon, which are both 10 kilometers away. 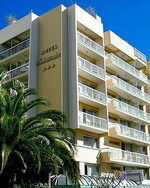 The hotel is 35 kilometers from Nice International Airport. Menton station, connected to Monaco by SNCF, is 800 meters from the hotel. Metz is a city in the northeast of France, capital of the Lorraine region and prefecture of the Moselle department. It is located at the confluence of the Moselle and the Seille rivers. Although historically Nancy was the capital of the duchy of Lorraine, it was Metz which was chosen as the capital of the newly created région of Lorraine in the middle of the 20th century, because of its past history as the capital of the region of Lotharingia - an origin found much more republican-friendly than the duchy-related theory, pointing to Nancy as the region capital. 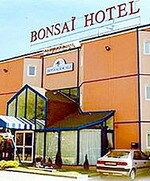 The Bonsai Hotel Metz is a basic modern hotel with a striking pink façade and glass portico, located opposite Metz Congress Centre, six kilometres from the city centre. The 56 guestrooms are decorated in white and blue with functional furnishings. Amenities include satellite television, desks and private bathrooms with showers. After a buffet breakfast in the hotel's bright, modern breakfast room guests can ask multilingual staff for advice or browse through the leaflet and tourist information in the reception area. Those arriving by car will benefit from complimentary onsite parking. The hotel is situated on the outskirts of Metz, and in the centre guests can visit attractions such as the 12th century Cathedral of Saint Etienne, one of the tallest cathedrals in France, and the Musée de la Cour d'Or. Metz Airport is 21 kilometres away, approximately 25 minutes drive by car. Novotel Metz Centre is located in Metz, France, 200 metres from Metz Cathedral, 500 metres from the Metz Museum, and two kilometres from the TGV train station. This modern hotel has an onsite fitness centre, an outdoor pool, wireless Internet access throughout the public areas, and meeting rooms. Novotel Metz Centre houses the Novotel Cafe and bar. French dishes are served throughout the day, whilst drinks and entertainment can be found in the bar during the evening. The hotel's 120 guestrooms all come equipped with satellite television, high-speed Internet access, climate control, and minibars. Montpellier is a city in southern France. It is the capital of the Languedoc-Roussillon region, as well as the Hérault department. The Festival de Radio France et Montpellier is a summer festival of opera and music held in Montpellier. The music festival concentrates on classical music and jazz with about 150 events, including opera, concerts, films, and talks. Most of these events are free and are held in the historic courtyards of the city or the modern concert halls of Le Corum. Le Corum cultural and conference centre contains 3 auditoriums. Citadines Apart'hotel Montpellier Sainte Odile is located north of Montpellier on the site of Sainte-Odile park. Relax away from the hustle and bustle of the town centre, although this apart'hotel is close enough to walk to the heart of the town where guests can walk through the narrow streets of the old town and enjoy the opera, cinemas, restaurants, museums and gardens. This property offers a beautiful outdoor pool and sundeck, a breakfast room and a reception lounge. Mediterranean beaches are conveniently just a 20-minute drive away. The studios include a sofa bed or two single beds. Each unit has a private bathroom with separate toilet. A hair dryer is available on request. Other conveniences include a fully equipped separate kitchen area with a stove, mini-oven and refrigerator, as well as an alarm clock and direct-line phone. 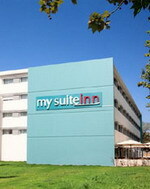 A modern hotel situated on the outskirts of Montpellier, three kilometres from the historic city centre and train station. Montpellier Airport is 14 kilometres from the hotel, with an approximate driving time of 20 minutes. The hotel offers conference and banqueting facilities for up to 50 business delegates, and staff at the 24-hour front desk can advise on local attractions. Practical amenities include on site parking and laundry facilities. Traditional Italian dishes are served at My Suite Inn's Restaurant Montpellier. The 113 air- conditioned guestrooms have contemporary decor in warm shades. Amenities include kitchenettes with ceramic hobs, microwaves, and refrigerators, cable television, direct- dial phones, and high-speed Internet connections. Place de la Comedie, a large pedestrianised square, is situated in the heart of the old town and is a good place to start tours of the city. 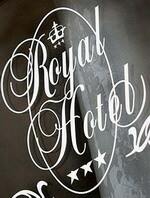 The Royal Hotel is a modern three-floor property situated in the historical city centre, two kilometres from the Corum Conference centre and Music Hall. The hotel features 46 air-conditioned guestrooms with traditional style decor in cream and terracotta and cream wood furniture. Guests can enjoy a drink in the lounge bar, and then use the Internet to keep in touch with friends and family. Those arriving by car will find parking nearby. Multilingual staff at the 24-hour front desk can assist guests, store valuables in the safety-deposit box, and advise on local amenities and attractions. Guests will find Old Montpellier, with its narrow, winding streets, 100 metres away, and the lively cafés of the Place de la Comédie 200 metres away. The Fougau Museum and Botanic Garden can both be found within 500 metres, and the coastal village of Palavas les Fiots is 15 kilometres away. Mulhouse is a city and commune in eastern France, close to the Swiss and German borders. It is the largest city in the Haut-Rhin department, and the second largest in the Alsace region after Strasbourg. Mulhouse is the principal commune of the 16 making up the Communauté d'agglomération Mulhouse Sud-Alsace (CAMSA), population (2006) 172,684. On 1 January 2010, the CAMSA will be replaced by the Communauté d'agglomération de la région Mulhouse-Alsace (CARMA), with 32 communes and 253,962 inhabitants. Mulhouse is famous for its museums, especially the Cité de l’Automobile (also known as "Musée national de l’automobile") and the Musée Français du Chemin de Fer (also known as "Cité du train"), respectively the largest automobile and railway museums in France. An industrial town nicknamed "the French Manchester", Mulhouse is also the main seat of the Upper Alsace University. 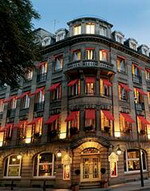 The imposing grandeur of the Hotel du Parc, with its red awnings and smart entrance is reflected in the hotel's history as a fashionable 1920s opened by the affluent Schlumpf family. Guests can enjoy cocktails in the indulgent roaring 20s atmosphere of Charlie's piano bar, with its wood paneling, geometric inlay and soft leather armchairs. The Steinbach restaurant offers traditional Alsacian cusine accompanied by Art Deco splendour. Fitness fanatics will appreciate the hotel's gym. Secure on- site parking is an added bonus. As well as the town center attractions, guest of the Hotel du Parc will find themselves just five kilometers from the Automatic Car Museum, 20 minutes from Ecomusée (an Alsacian model village) and 25 from the region's vineyards. Mulhouse Euroairport is 25 kilometers away. The airport bus stops near the hotel. Nancy is a city in the Meurthe-et-Moselle department in north-eastern France, and formerly the capital of the Duchy of Lorraine, and then the French province of the same name. The Place Stanislas named after the king of Polish-Lithuanian Commonwealth and duke of Lorraine StanisLaw Leszczyski, Place de la Carrière, and Place d'Alliance were added on the World Heritage Sites list by the UNESCO in 1983. The "École de Nancy", a group of artists and architects founded by the glassmaster and furniture maker Émile Gallé, worked in the Art Nouveau style at the end of the 19th century and the early 20th century. It was principally their work which made Nancy a centre of art and architecture that rivaled Paris and helped give the city the nickname "Capitale de l'Est." The city still possesses many Art Nouveau buildings (mostly banks or private homes). Furniture, glassware, and other pieces of the decorative arts are conserved at the Musée de l'École de Nancy, which is housed in the 1909 villa of Eugène Corbin, a Nancy businessman and supporter of the Art Nouveau there. The old city centre's heritage dates from the Middle Ages to the 18th century. The cathedral of Nancy is a fine example of 18th century architecture. The surroundings of the train station are a busy commercial area. There is also a major botanical garden in Nancy, the Jardin botanique du Montet. Other gardens of interest include the city's earliest botanical garden, the Jardin Dominique Alexandre Godron, and various other public gardens and places of interest including the Pépinière and Parc Sainte-Marie (public gardens). There is also the aquarium, the Musée de l'École de Nancy, the Musée des Beaux-Arts and the Musée Lorrain amongst others. 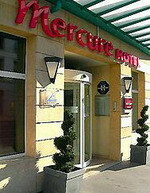 The Mercure Nancy Centre Stanislas is located in Nancy, France, in the city centre. It is 200 metres from the Museum of Fine Arts, the Ballet Theatre de Nancy, and Place Stanislas square. There is wireless Internet access throughout the hotel. The front desk is open 24 hours a day and the hotel is air-conditioned. Valet parking is available. Two meeting rooms that can cater for up to 40 people are available. There is a bar on site at the Mercure Nancy Centre Stanislas. 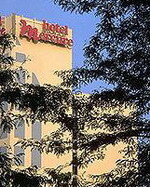 There are 80 air-conditioned guestrooms. Amenities include satellite television and pay movies, direct-dial phones, wireless Internet access, bathrobes, coffee and tea facilities, minibars, and complimentary bottled water. 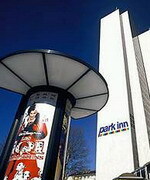 The Park Inn Nancy is ideally located in the heart of Nancy, opposite the railway station. 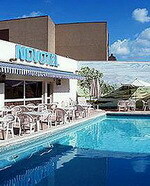 The hotel offers 192 standard and superior rooms and boasts an in-house restaurant and an in-house bar. This full service, upscale, "Art Nouveau" style hotel also offers conference and meeting facilities as well as a 24-hour reception. From the hotel, you can easily take a short stroll to the city's museums, Stanislas Square and the convention center. There are also plenty of shops and restaurants in the area. A bit further away (about 20 minutes on foot), you'll find the famous Musée Ecole de Nancy. Rooms come fully equipped with air-conditioning, mini bars, satellite and cable television channels, pay-per-view channels, and radios. Each room has a private bathroom. Nantes is a city in western France, located on the Loire River, 50 km (31 mi) from the Atlantic coast. The city is the sixth largest in France, while its metropolitan area is the eighth with 804,833 inhabitants at a 2008 estimate. Nantes is the capital of the Pays de la Loire region, as well as the Loire-Atlantique département. It is also the most important city of the historic province of Brittany, and culturally still remains strongly identified with it. In 2004, the magazine Time described Nantes as "the most livable city in all of Europe". 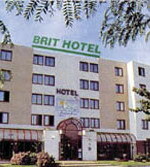 The Brit Hotel Amandine is a modern hotel set in Nantes' business district, opposite Stade de la Beaujoire and 15 kilometres from the Muscadet wine region. Guests can browse the complimentary newspapers over breakfast (surcharge), and relax in front of the television in the hotel lobby. Business guests can benefit from a choice of five meeting rooms, and any visitors arriving by car will find complimentary parking onsite. The hotel houses its own bar, which serves a selection of wines from the nearby Muscadet wine region. Guests can also use the wireless Internet access for leisure or business purposes and seek tourist information from the 24-hour front desk. Those wishing to explore the area will find a Fruit Farm five kilometres away, and the Musee Beaux Arts and Musee Jules Vernes within 16 kilometres; guests can also enjoy a day out at either Chateau De Barbe Bleu, 45 kilometres away, or Puy Du Fou theme park, 70 kilometres from the hotel. The Mercure Ile de Nantes is located in Nantes, France, on the River Loire. It is three kilometres from the Jules Verne Museum and the Cathedrale Saint Pierre. The hotel has an outdoor swimming pool and wireless Internet in its public areas, which are air-conditioned; there is free onsite parking. Mercure Ile de Nantes has a restaurant, La Table de l'Enchanson, serving international dishes; there are also two onsite bars, offering snacks, musical entertainment, and drinks. The hotel's 100 climate- controlled guestrooms, all have satellite television, climate control, telephones with voicemail, wireless Internet access and hair dryers. 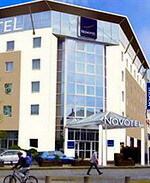 The Novotel Nantes Centre Bord de Loire is a 3-star hotel located opposite the Loire just a short walk from the city center, train station and convention center. The hotel has air-conditioned and recently renovated rooms, private parking and an indoor car park as well as 3 meeting rooms ranging from 323 to 646 sq. ft (30 to 60 m²). Guests can also enjoy a meal or relax with a drink in the contemporarily decorated restaurant and bar. Its exceptional location opposite the Loire, minutes from the city center and the convention center, makes this the ideal hotel for your trip to Nantes. Relax in our hotel, which was completely renovated in 2009 to give it a contemporary, stylish feel!